Trump’s St. Louis rally was interrupted repeatedly by protesters, and police said 31 people were arrested and charged with general peace disturbance. One person arrested outside the event was charged with third-degree assault. Protesters have a right to attend rallies held by candidates they oppose, but they have no right to disrupt them. If they do so, they should be removed, forcibly if necessary. If they hit someone, they should be hit back–twice as hard, as a notable American once said. As Paul noted earlier, Trump’s rally in Chicago was postponed due to a threat of violence by pro-Bernie Sanders protesters and other assorted lefties. Actual violence seems to have been minimal, and canceling the rally may have been an excess of caution. Still, knowing how Trump’s left-wing opponents have behaved, it may have been prudent. Weirdly, in my view, many critics have blamed Trump for the violent and disruptive antics of the extremists who have infiltrated his rallies. See, e.g., Ruth Marcus in the Washington Post. MSNBC applauded the borderline violent demonstration that shut down Trump’s Chicago event, and Chris Matthews and his guests suggested that Trump had it coming. 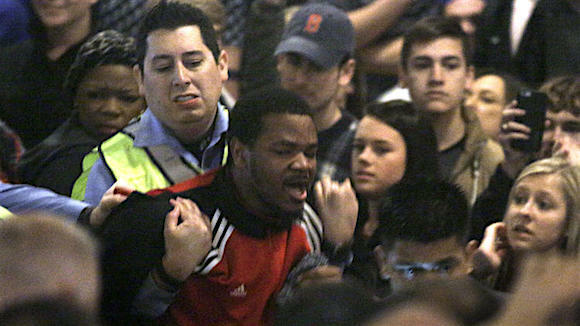 Even Ted Cruz laid blame at Trump’s feet for the fact that scuffles have broken out at his rallies. Blaming Trump for inflammatory rhetoric would make sense if his followers were roaming the streets attacking passers-by, or infiltrating Clinton and Sanders rallies and attacking Democrats. But they aren’t. Not a single such instance has occurred. On the contrary, every violent or disruptive event has involved people associated with the Democratic Party trying to prevent Trump from being heard. Whose inflammatory rhetoric has inspired them? Certainly not Trump’s. The brownshirts are all on the left, as usual. Leftists are the instigators here, and they deserve unqualified condemnation. There is no excuse for trying to shut down a speech by a politician with whom you disagree. None. And it is shameful that many liberals, and even a few conservatives, have seized the opportunity to blame anti-Trump excesses on Trump.